There is another event at the Civic Center tonight so for our preview sales this evening we will be entering and exiting through the loading doors at the southwest corner of the Exhibit Hall. 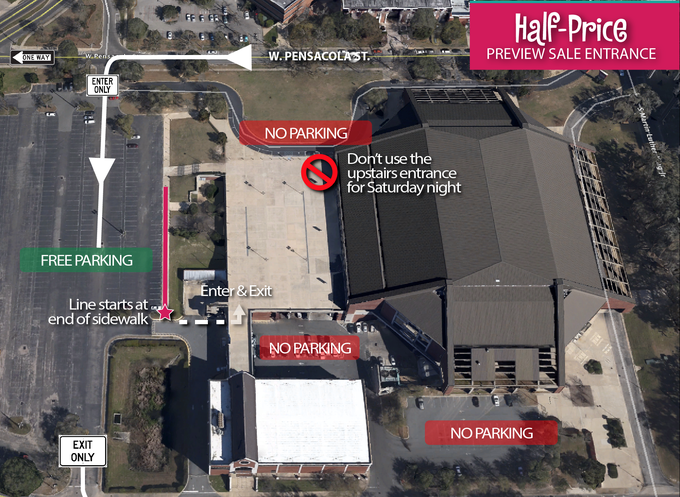 We will have the lines set up on the sidewalk along the edge of the parking lot - see the map below for details. Thanks for your cooperation. Answers to most of your questions can be found on our website, but here is a short list of some of the most frequently asked questions (with answers) that we've been getting about our upcoming sale. The only items that have limits are clothing and shoes. Only 75 items of clothing will be allowed per consignor. There is one exception, if all of your clothing is marked to donate then you may bring 100 items to sell. We only accept 10 pairs of shoes. With the smaller space, we are going to be extra picky during inspection, so bring only your best! What clothing items are acceptable at the Fall sale? holiday clothing (Christmas, Thanksgiving) sell really well. anything sleeveless or with spaghetti style straps-save these items for the spring! If I group onesies or similar like items together does that count as 1 item? Yes, if you package 3 or 4 like items (onesises, tights, sleepers) together that will count as 1 item. However, be very sure that each item is clean and acceptable or the whole group of items will be removed and unsold. Also, please double check all items grouped are the SAME SIZE. What hangers can I use and will I get them back? Almost any hanger is acceptable as long as your items are well attached and fit the hanger appropriately. Do not use adult hangers for tiny baby clothes, or the opposite. The plastic retail hangers that you get when you buy clothes at various stores are fine. Wire hangers are our least favorite but do work well for pinning pants. Start looking now for hangers to buy as they will start disappearing from shelves as we get closer to sale time! You will not get your own hangers back at the end of the sale. However, any clothing items you purchase will come with hangers that you can keep. Start stock-piling hangers now in preparation for spring. I’m a consignor, when can I shop? Can I bring a guest? All consignors can start shopping on Thursday at 5:00 pm. You will receive a wristband when you check in which will get you in to the Preview Sale on Thursday night. You may buy one additional band for $10 to bring a guest. Everyone who enters the preview sale must have a wristband. If you volunteer you will be invited to shop earlier based on how many hours you volunteer. See the Preview Sale Schedule for more information. How will consignor drop off work this sale? The biggest change for drop off is doing it all in one day. This is new for us, so please be patient as we work through this shorter process. Each consignor MUST HAVE AN APPOINTMENT. The appointments are now every 15 minutes, so please arrive on time. When you arrive at the civic center, you will see signs directing you where to go. As of today, all consignors will enter at the south side of the civic center, but that is subject to change. To make it easier for you, organize your items into these same categories. You will visit each station, drop off your items and proceed to the wristband table. Once you put out your inspected clothing items; you will receive your wristbands, pick up any rejected items and you are out the door! If you choose our Drop & Go Check-In , the process will be easier and faster for you. Upon arrival, a welcome volunteer will confirm your appointment time and direct you to the location to park. An unloading volunteer will remove the items from your car and deliver them to the inspection stations. We will take care of everything, except any items that need to be put together. This includes furniture, pack n' plays or the like. Once all your items are unloaded, a wristband volunteer will bring you wristbands and answer any questions you might have. Any rejected items will be automatically donated and not returned to you - so please make sure to double-check everything has batteries, none of your items have been recalled and you don't bring anything on our Unacceptable Items list. NO REJECTED ITEMS WILL BE RETURNED. That is the biggest difference between the two types of check-in. Finally, if you were a consignor who had no rejected items at the spring sale, you will follow the same procedure as Traditional Check-In. The only difference is that you do not need to put your clothing out and if you have any rejected items that are found after you have left the building, we will store them and have them ready for you on Sunday to pick-up. We will have a list of those eligible consignors at the Welcome Table, so just let them know when you arrive. We appreciate everyone for hanging in there with us as we searched for a new location, broke all records for consignor registration and navigate this new location. We couldn't do this sale without each of you and look forward to seeing everyone soon! The One Week Boutique is moving to a new location! The Fall 2014 sale will be held in the Donald L. Tucker Civic Center in downtown Tallahassee on October 8th-12th. The space is a bit smaller than our most recent sites at the Tallahassee Mall, but we are excited to have a space and plan on making the most of every inch! Consignors will be asked to pay the $10 organizational fee up front at the time of registration. This fee is non-refundable. All of our consignors will be checked in on Wednesday, October 8th between 9am-7pm. Those appointments will NOT be available until September 15th. We will NOT be accepting purses or maternity clothing at this sale. The minimum selling price of each item is $2.00. Clothing limits are the same as last sale: 75 items per consignor, or 100 items if ALL are marked to donate. We have also added a few more things to our Unacceptable Items page, so please review that. Starting this sale, we are offering an easy option for check-in. There will be a “Drop & Go” option at consignor check-in. Instead of bringing your items in and waiting while they are inspected, you will have the option to drop things off with a volunteer at the curb. Volunteers will shuttle your items in (with a few exceptions). They will go through our inspection process, but you do not have to wait. To take advantage of this new service, you have to agree to DONATE ALL rejected items. If you decide not to use the “Drop & Go” option then you will follow the usual check-in process. No matter which option you choose, all consignors will still need to register for a check-in time. Please Note! If you were a consignor who didn’t have any rejected items last sale, you will receive an email before consignor check-in explaining how your check-in process will work. Due to the change in venue, the Fall sale will be a bit shorter. The full schedule , including times, is posted on our website. The only items that have limits are clothing. Only 75 items of clothing will be allowed per consignor. There is one exception, if all of your clothing is marked to donate then you may bring 100 items to sell. Maternity items are limited to 15 pieces, and shoes are limited to 10 per consignor. Bring your best! What clothing items are acceptable at this sale? Our sales are seasonal so some items will not be accepted for sale at this spring event. We will accept all shorts, t-shirts, tank tops, bathing suits/cover ups, short sleeve dresses, and Easter clothing. Jeans are acceptable, as are pants as long as they are not fleece or corduroy. Long-sleeved shirts are also acceptable as long as they are not too heavy. We will not accept any costumes or winter clothing at this sale. This includes jackets, winter hats, scarves, gloves or boots. No fleece or heavy sweaters/sweatshirts. Save these items for fall! Yes, if you package 3 or 4 like items (onesises, tights, sleepers) together that will count as 1 item. However, be very sure that each item is clean and acceptable or the whole group of items will be removed and unsold. You will not get your own hangers back at the end of the sale. However, any clothing items you purchase will come with hangers that you can keep. Start stock- piling hangers now in preparation for fall! All consignors can start shopping on Wednesday at 5:00 pm. You will receive a wristband when you check in which will get you in to the Preview Sale on Wednesday night. You may buy one additional band for $10 to bring a guest. Everyone who enters the preview sale must have a wristband. There are many aspects of our sale that are rewarding and make the management of The One Week Boutique so worthwhile. We like giving families a way to find great bargains on items they want and need for their little ones. We like providing a way to recycle clothing and toys that our little people use so briefly. We love providing a way for families to make some money! But, even with all these things, truly the most gratifying part of the sale is when we donate items to local charities. The charities we work with are always so appreciative of the donations they receive. They send volunteers to the sale site on the last night of the sale to pack up all the items marked for donation. They then sort and organize these items and find specific families in need who will benefit from our donations. An important requirement for an organization to receive donations from us is that they must give the items to families directly. They do not re-sell our donations. After every sale we receive notes of gratitude from these organizations letting us know how many people have been helped by the donations from The One Week Boutique. As another sale is approaching we’d really like all of our consignors to consider donating as many unsold items as possible. We understand that there are always a few things that consignors want back if they don’t sell. But, please, please consider all the small clothing items that you mark for just a couple of dollars, and think how much a few items of clothing could help someone who has virtually nothing. The PHI (Pregnancy Help and Information) Center has been our longest charity partner. Since our first sale in August of 2006, we have worked with PHI to provide donations. The PHI Center offers support and classes for women who are pregnant, as well as for their partners. They have a unique system where clients earn credits to pick out items from their donation room, known as the Stork Room. “The donations we receive from you really sustain us,” said Karen Luger, director of client services at PHI. “Your items fill such a huge need for us, and provide for so many families. We are always extremely grateful for everything we get from The One Week Boutique.” Karen has mentioned that tiny baby clothes, and infant and toddler boy clothes, are always high on their list of needs. Another organization that has been a recipient of our donations almost since the beginning of The One Week Boutique is Brehon Family Services. This non-profit organization provides assistance to pregnant women and families with young children who are experiencing challenging life situations. There is also a house known as Brehon House where homeless pregnant women can live and receive case management services, career counseling, assistance finding housing, and parenting training. Our donations go to serve Brehon clients in both the Brehon House as well as out in our community. Again, these items are given directly to clients. Over the years we have also donated items to a variety of other well-deserving organizations including the Refuge House, Christmas Connection, the Pediatric ICU and the Zeta Phi Beta community baby shower, to name a few. After each sale we take books to the Early Learning Coalition and donate clothing to local schools to keep in their “rainy day” closets. The items that consignors choose to donate truly reach all corners of our community. So, as you all work to tag and price your clothing, please also think about marking “donate” on your tags. That way, if any of your items go unsold, you will know that they will find a good home in our own community! Did that get your attention? We are ready to help our consignors make the most money they can! There are just a few basic things that you need to remember when you start getting your items together to sell. Iron your clothes! You would be amazed how much better clothing looks when they are not full of wrinkles. Not only will they sell better, but they will bring more money. Ironing (in bright light) is also a great way to really inspect your clothing for stains. Stains were our #1 complaint among shoppers at our last sale. We do our absolute best to check for stains during check-in, as well as do another full clothing rack inspection prior to opening, but we still tend to miss some items. We pull hundreds of pieces during the sale for stains. You are our first level of defense against bad quality, so check your items carefully!! Price your items right! First-time consignors are notorious for pricing their items too high and are usually disappointed in their sales. There is an easy rule of thumb I tell consignors - start at 50% of what you paid and adjust up or down, based on quality. If you paid $7 for a t-shirt at Target and it's still in like-new condition, $3 is what it should be priced. If you paid $30 for a dress at the Gap and your child only wore it once, then $17 is a great price. We also strongly encourage you to mark your items to be discounted on Sunday, especially clothes! We sell tons of clothes on Sunday. Package your items so shoppers can easily inspect them! This is mainly goes for blankets, bedding, accessories and cloth diapers. Hang as much as you can, but if your item is too small, then use safety pins to attach your tag or keep multiple things together. If a shopper can't easily inspect it, one of two things will happen...they will pull everything out of your bag (which results in missing pieces) or they won't even consider it. Secure your small items! This is our biggest challenge at each sale and no matter how hard we try, we end up with boxes of little pieces at the end of the week. Use clear bags and lots of tape! Kids want to try out the toys and you should package with that in mind. We also find it helpful if you note on your tag what is included with your item. For example "3-Piece Train Set with 10 Small Pieces". You can hand write this longer description on the back or your tag, if it won't fit on the front. Give us a good description! In the hustle and bustle, tags do fall off. If you have a good description, we can easily reunite your missing tag with your item, which means it goes back on the floor and has a better chance of selling! Brand names, brief description (colors/design) and correct sizing is imperative. I hope these tips will help you as you start getting ready for The One Week Boutique! As you have (hopefully) heard, we are moving to a new location after many years in the former Goody's store. The previous location has been leased by City Church and we wish them the best as they renovate their new home. 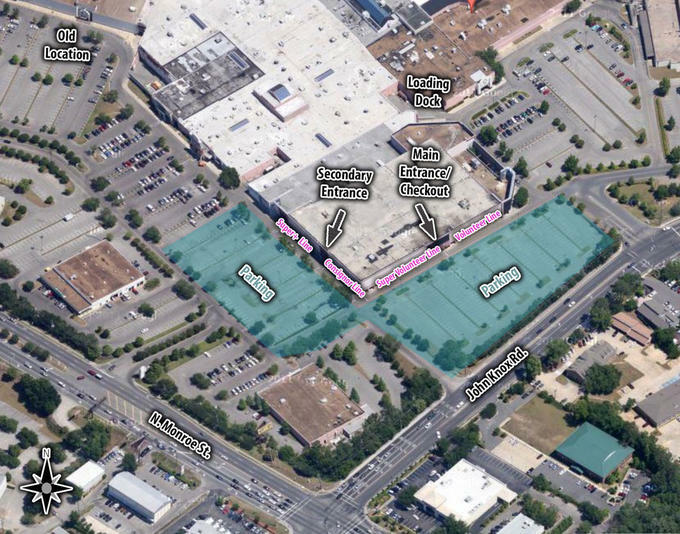 Going forward, we will be operating in the former Dillard's store at the Tallahassee Mall. This is south of our previous location (towards downtown) at the corner of John Knox and N. Monroe. We will have large banners hung to help you find it. We will be using a portion of the first floor in the southwest corner. Access to upstairs and other unused areas of the store will be blocked. For your safety, please do not try to enter these areas. Two entrances will be in use for this event - the one facing N. Monroe (west) and the middle entrance on the John Knox (south) side. There is no entrance to the mall from this location and other exterior entrances will be closed. If you need to access the mall you will need to go outside to a regular mall entrance. Our primary entrance/exit will be the one facing John Knox Rd. Please use our primary entrance (facing John Knox Rd.) and the adjacent parking during your scheduled drop off time. The entrances are limited to 30" wide so if you have large items plan to drop them off separately on the loading dock around the back of the store. Contact us when you arrive for instructions and assistance with large items. A limited number of shopping carts, rolling racks and flatbed carts will be available for you to use during checkin. Previously, volunteers and consignors lined up for preview sales inside the mall. Preview sale lines will now form outside in the covered sidewalk area. Each preview sale group should line up in the designated areas on the map. Exterior signage will provide additional guidance. The checkout area will be set up just inside the Main Entrance/Exit facing John Knox. Our location has plenty of free parking as shaded in blue on the aerial photo above. The plumbing in our new location is not in working order so we will be providing restrooms in a portable trailer just outside the store's northernmost exterior door. This will not be an exit and only access to the restrooms will be provided through this door. Of course, the mall restrooms will be available as well. If you would like to visit the mall before or after our event, there are entrances outside our location on both sides. Please come to the main entrance for pickup between 5:30 and 7:30pm on Sunday. Other entrances will be closed during this time. For each of the last few sales we have had to turn away consignors because of space limitations. Creating a comfortable shopping experience means that we limit the number of items we can accept for each event but after the first day or two of selling we have plenty of room. Starting this Fall, we will be bringing in more inventory on Friday to make more items available to shoppers for great prices and to give even more consignors an opportunity to cash in while cleaning out. Consignors who register after the normal registration is full will choose a Friday morning check-in time and we will put their items out on the floor before Noon on Friday. More space will be available on our shelves, racks and floor by then to accommodate these additional items without crowding. We have added restocking details and registration in the Consignor section of our site. Please review the changes applicable to restocking consignors such as item category limitations, reduced consignor fees, and preview sale access. Plan to come back for another look on Friday and/or Saturday as you can expect new items to be available in most product categories. If you weren't planning to shop on Thursday because it is so busy you will have a wider selection after the initial rush than you might have had at previous events. Restocking is new for us and the logistics are subject to change as we get this new enhancement up and running. We would appreciate your feedback on the program and ways we might improve it at any time. As our sale quickly approaches we thought it would be helpful to give our new consignors a little "behind the scenes" look at how the drop-off (check-in) process works at The One Week Boutique. At our spring sale, we checked in over 63,000 items in 3 days. That means we inspected 2,500 items, per hour! Crazy to think of it that way! The most important advice we can give you is to read through the consignor section of our website BEFORE you begin entering or tagging your items. We know it can be a lot of information, but it's worth it not to have done something wrong only to realize it at drop-off. Especially make sure your tags are printed correctly so they will scan. Every consignor must have an appointment and we ask that you arrive within the 30 minutes of your appointment time. So, if your appointment is at 4:00, then you are welcome to come anytime between 4:00-4:30. My best advice is to arrive about 10-15 minutes after your appointment time. If you come early we will fit you in as soon as we can but there may be a wait. Once you arrive you will be asked to fill out a consignor agreement form, pick up your wristbands for entry into the preview sales and have all your items inspected by one of our volunteers. After inspection we ask each consignor to assist in putting your items on the sales floor. Please do not send your husband or friend or family member without letting them know this is part of the process. We promise to do our best to have you in and out in 30 minutes or less...depending on how much inventory you bring. If you plan to bring more than 200 items (remember our item limits for individual categories) please let us know so we can have resources available. During the inspection we are looking for a number of things...stained/overly worn items - tags are done correctly - working batteries are included. In a perfect world, we wouldn't have to return anything back to our consignors, but that rarely happens. Please don't be offended if an item is returned back to you. Even if you have an item priced low, we won't except anything below our quality standards! Remember that we also have item limits - 100 children's clothing items, 15 maternity items and 10 pairs of shoes! Finally, we ask that all of our consignors help us advertise. We can provide you with full color flyers and yard signs to help us spread the word about the sale. YOU ARE OUR BEST FORM OF ADVERTISEMENT! So please, email your friends and family and tell them to go shop. Post about us on Facebook. Put flyers at your school, church or workplace. Encourage everyone you know to come and buy your stuff! As always, if you have any questions, please contact us at questions@theoneweekboutique.com . The most important part of this whole process is deciding what items you plan on selling. It can be overwhelming so we suggest you start early. Go through all your items to make sure they meet our strict guidelines - checking your clothing for stains, making sure all your relevant items have working batteries and items are clean. Each sale we continue to strive towards only selling QUALITY items and we count on our consignors to read through our Acceptable Items page and only bring what we can sell. Pricing is a common question for new consignors. Our guidelines (for everything we sell) is start at 50% of what you paid for it, then adjust up or down based on the quality. Name brand clothing (Gap, Gymboree, Ralph Lauren) will obviously bring in more money vs. discount brands (Circo, Old Navy, Garanaimals). We strongly encourage everyone to include their items in the 1/2 price sale and check the discount box on the tagging software. If your item is in great condition and didn't sell at full price, it will usually always go at 1/2 price. Before printing your tags, please read this post regarding bad tags and what we won't accept at drop off. If your tag doesn't scan, there is a much greater chance that an error will be made if we have to hand type each one of your tags during check-out and you won't receive credit for your item. If your tag looks like it might not scan, we will do a test scan at drop off. Using card stock and safety pins is a strict requirement . If you bring in paper tags, you will be asked to reprint them on card stock. We do accept pricing guns, but make sure your tag is secured in seam so not to make a large hole in the garment. You may use plastic or wire hangers, but please use children size for any size under 8. These fit better on our racks and won't stretch out the clothes. About a month before the sale we will open our drop off appointments. Please make sure you schedule an appointment early to get a day and time that is most convenient for you. We ask that you arrive on time and be prepared to spend 20-30 minutes to complete the check in process. Your items will be thoroughly inspected and then you will assist your volunteer in placing your items on the sales floor. Read here for more details . To me, the biggest "perk" of consigning (besides the profit check) is being able to shop early at the Consignor Preview Sales . Not only do you get to shop before we open to the public, but new to this sale, we are letting our consignors shop early at our 1/2 price sale on Saturday evening. At drop off you will receive a wristband that will allow only you into the sale. If you wish to bring a spouse, parent or helper - you must purchase a $10 guest pass. We also strongly encourage you not to bring your children as preview sales are very busy! If you do bring your child, we ask that you keep them with you at all times. Our volunteers are vital to the success of The One Week Boutique. To thank them for their effort, we offer even earlier shopping times to our volunteers as well as ways to earn Boutique Bucks. Our shifts are mostly 3 hours long and are scattered throughout the sale week. Read here for more details on how to become a volunteer . The last event of our sale is Consignor Pick Up where all of the consignors who did not donate their items come and pick up what didn't sell, along with their profit check. When you arrive all of your items will be together, with your consignor number. You will retrieve your items and make your way to the check out area. Here we will inspect your items to make sure they all belong to you and deliver your check. Depending on how many people are there, this process can take a while and your patience is appreciated. If you have chosen to donate your items to one of our amazing charities and don't come on Sunday, your profit check will be mailed within a few days. As always, we welcome your questions. Either post them on our Facebook page or contact us through our website .